We’ll take a morning flight to Pitalito and from there drive approximately 45 minutes to the newly opened Hotel Monasterio de San Agustín. This region was inhabited by two enigmatic indigenous cultures that created fantastic sculptures using volcanic rocks approximately 5,000 years ago. They lived in the adjacent river valleys of the Magdalena and the Cauca. Divided by impassable peaks, the two rivers were these peoples’ transportation system. San Agustín, where the rivers joined, was where the two tribes met to trade, bury their dead, and worship. A now-extinct volcano close by left volcanic rock, from which local tribe members used to carve towering statues. 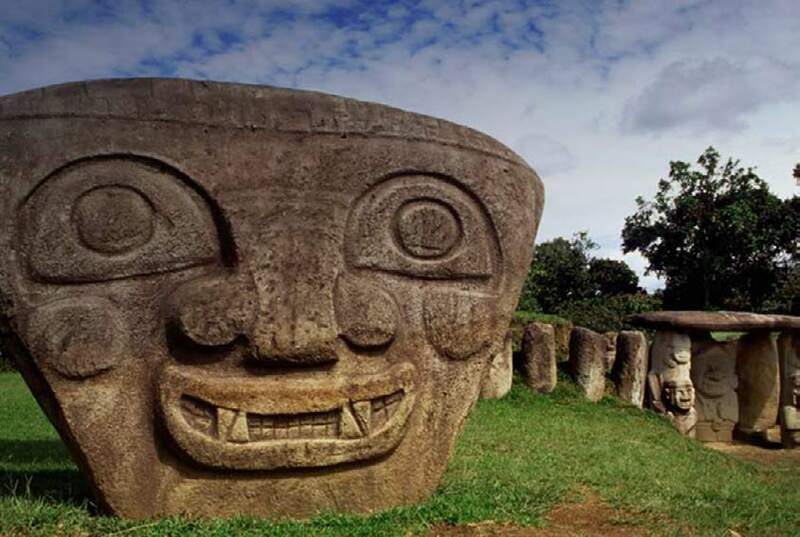 These statues were used as part of funerary rituals, and, today, statues in the forms of pumas, snakes, and warriors still loom over the lush green hills surrounding San Agustín. This afternoon will start with a visit to the Archaeological Museum of San Agustín, which provides an excellent introduction to the site and the area’s culture. We’ll continue on to the San Agustín Archaeological Park, a UNESCO World Heritage site, where 130 monuments are displayed, as well as the Fuente de Lavapatas, a ceremonial fountain where images of serpents, lizards, and human figures are carved in a labyrinth of ducts in the rocky bed of a stream. Archaeologists believe the baths were once used for ritual bathing and the worship of aquatic deities. From here, we’ll walk to the Alto de Lavapatas, the oldest archaeological site in San Agustín, where imposing statues guard ancient tombs. The prehistoric site also offers a panoramic view of the surrounding countryside. After lunch at a local restaurant, we’ll visit a number of less-known sites, including the Alto de las Piedras, which features tombs made of rock slabs with signs of red, black, and yellow coloring. Doble Yo is one of the most famous statues, which, on closer examination, is actually composed of four separate statues. Nearby, at La Chaquira, divinities are carved into the mountainside and overlook the stunning gorge of Rio Magdalena. We’ll have dinner at the hotel in the evening.